Pandan leaf or Bai Toey in Thai (aka screw pine, daun pandan) is a green, narrow leaf with deep grove along the length of the leaf. The fragrant leaves are used in main course dishes, desserts and drinks. As you can see in the picture, the plant loves water. 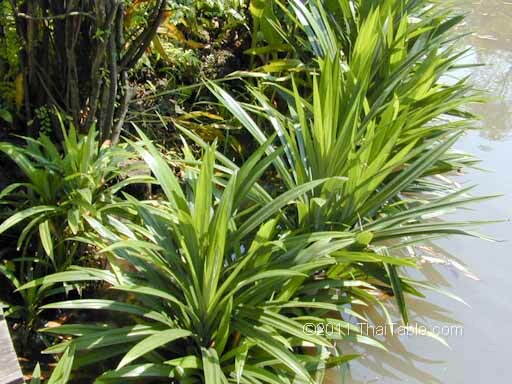 Pandan leaves are available fresh and frozen at many Asian markets. Fresh pumpkin sticky rice balls in sweet coconut milk sauce.